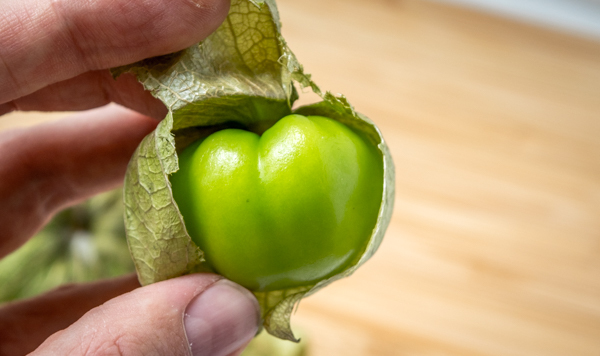 So what exactly is a tomatillo? And where can I get some?! You may have walked past these in the produce section without knowing how much goodness they contain! Feel free to pull open the husks at the supermarket. And say hello to tomatillos! 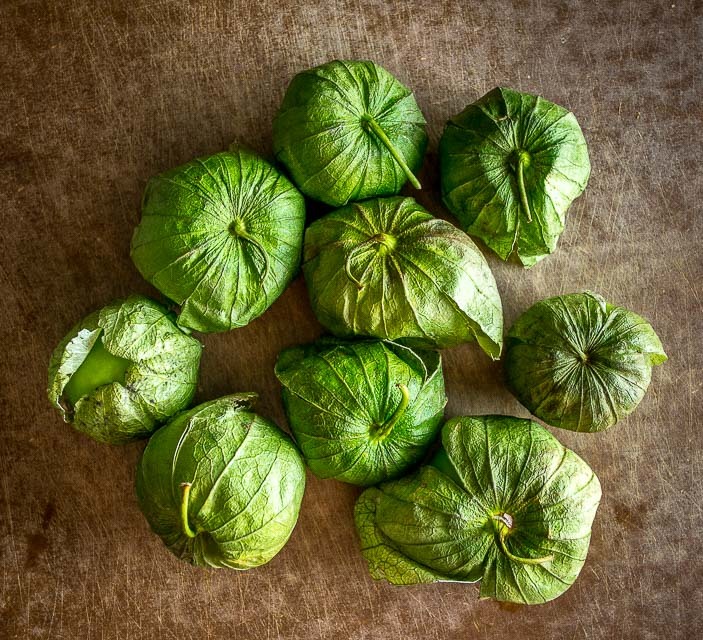 Tomatillos have a vibrant, tart flavor with citrus undertones, and they are the key ingredient in dozens of Mexican green sauces. If you’ve ever had Enchiladas Suizas or Salsa Verde then you’re already familiar with the flavor of tomatillos! Try to buy the ones that have taut green skin inside. If they are pale or mushy they are past their prime. And while you can use raw tomatillos it’s much more common to use them cooked or roasted. This sweetens them up and makes them less tart. There are many ways to do this. First, pull off the husks and give them a good rinse. They’re usually a bit sticky on the inside, so it’s best to give them a thorough clean before using them. I’m in the habit of cutting out the stems but you can consider this optional. To roast them, I typically plop them in a 400F oven. Once they turn army green in color they are officially roasted. This batch was in the oven for about 15 minutes. You can also pan-fry or boil them. We have an article that details the differences in those methods here: 4 Different Ways To Make the Same Salsa. The key is to apply sustained heat to the tomatillos, even though there are many ways to get there. This maximizes their flavor potential so don’t skimp on this step! 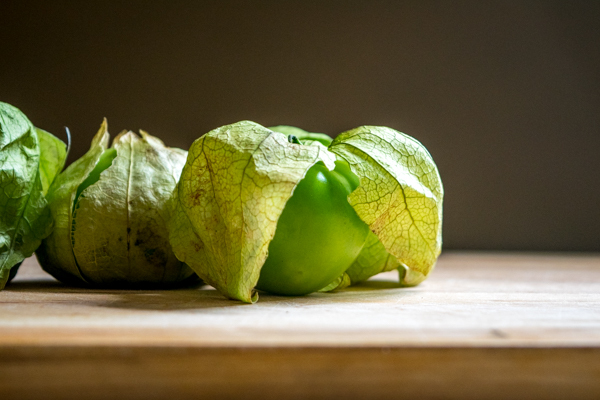 Tomatillos are easy to store — it’s almost as if they want to be a permanent part of your kitchen! Keep them in the fridge, husks intact, and they will keep for weeks at a time. I just leave them in the plastic bag they were purchased in and plop them in the crisper drawer. 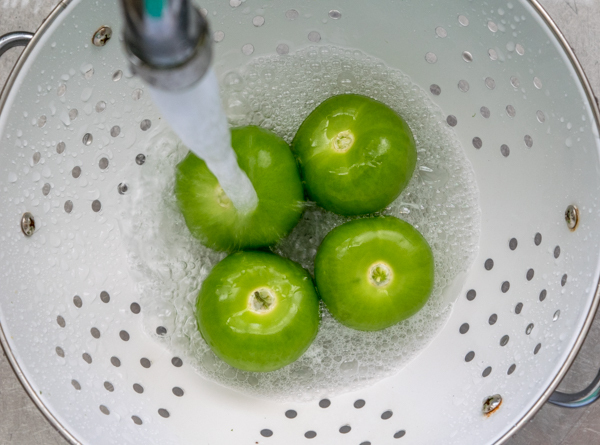 Can you substitute green tomatoes for tomatillos? 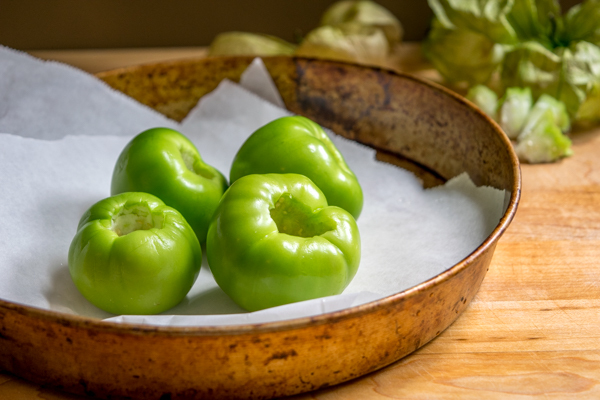 Although the term tomatillo could be roughly translated as “little tomato”, you don’t necessarily want to substitute green tomatoes for tomatillos. 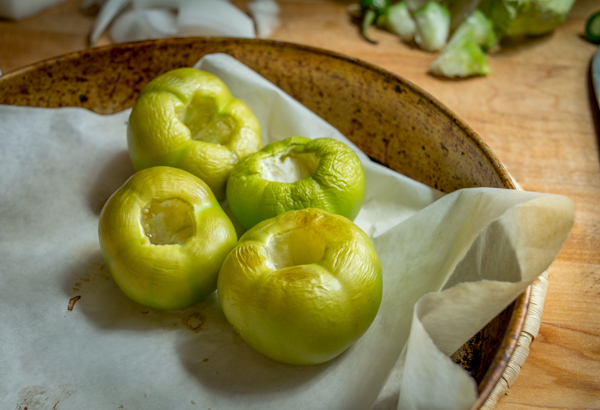 Green tomatoes are unripe and have limited use compared to fresh tomatillos. Plus your dishes won’t taste the same as they each have their own unique flavor profile! What’s The Best Way to Use Tomatillos? First, make sure you try them in an authentic Salsa Verde recipe. 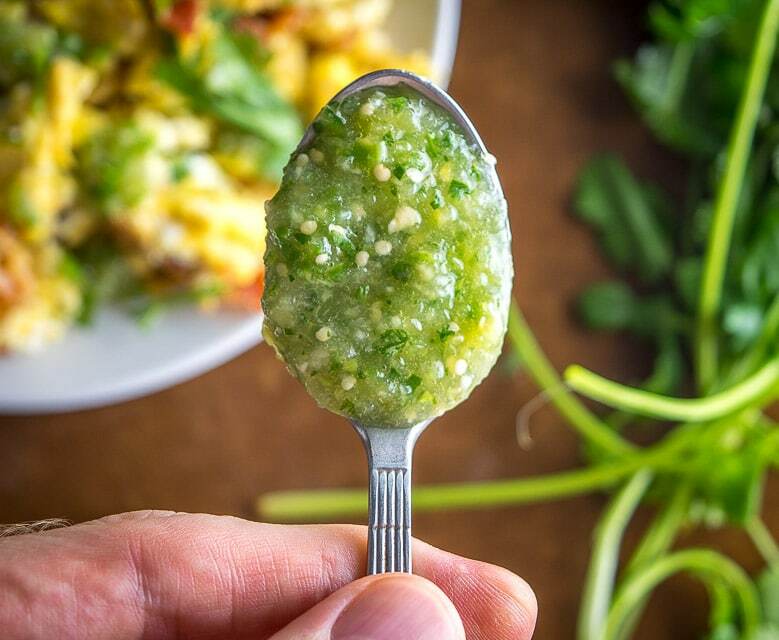 You’ll be blown away by the upgrade in flavor when you make your own Salsa Verde at home. It’s a real treat and it will have your friends and family asking for more, so consider yourself warned! 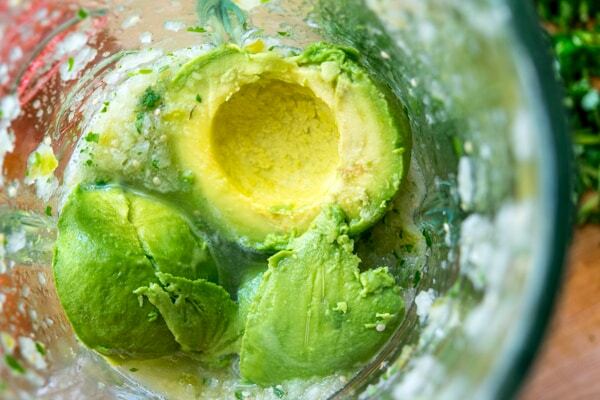 You can quickly turn this into a lip-smacking Avocado Salsa Verde by simply adding a fresh avocado to it. 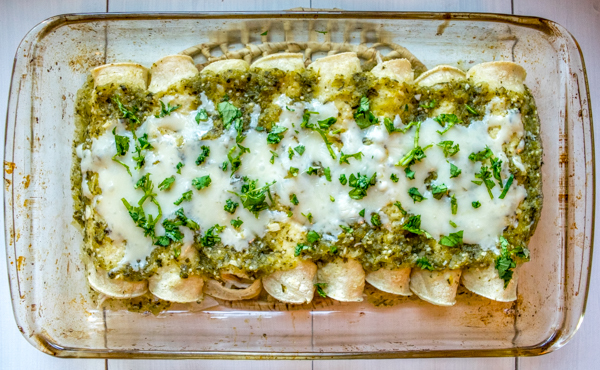 You can also make some incredible Enchiladas Suizas using fresh tomatillos. This is a creamy green sauce that works wonders when drenched over some freshly made enchiladas and it is delish! We also use fresh tomatillos in our Chicken Tinga. Most Tinga recipes are tomato based but if you add a few tomatillos to the mix it really brightens up the flavor. And yes, you can use canned tomatillos in a pinch and get a similar result in all of these dishes, but you’ll always get superior flavor from fresh tomatillos. Okay, let me know if you have any more questions about tomatillos. 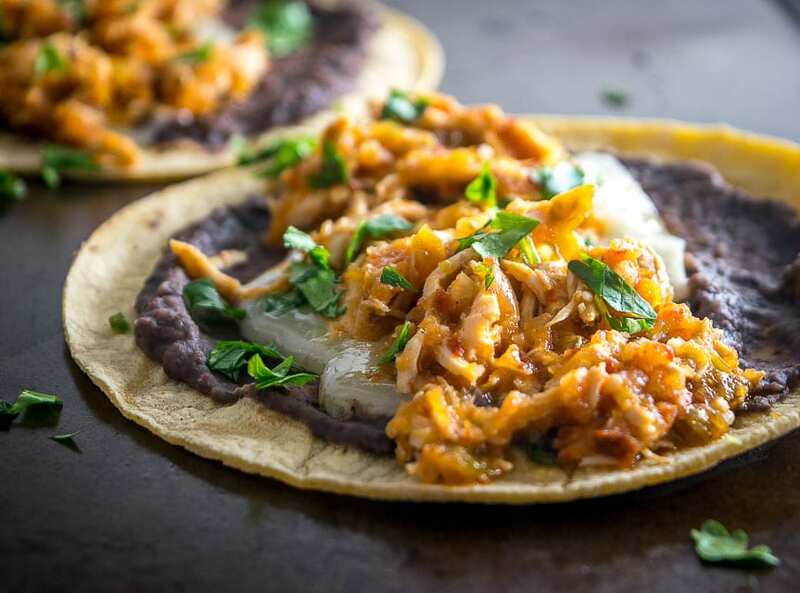 They are one of the most important ingredients in Mexican cuisine and once you’re in the habit of buying them you’ll have access to loads of drool-worthy recipes.